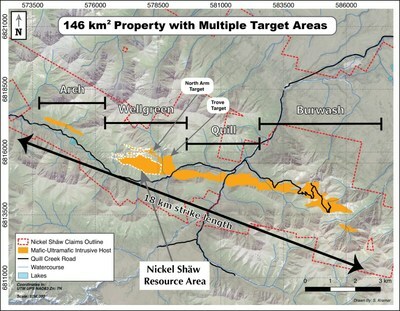 TORONTO, April 25, 2018 /CNW/ - Nickel Creek Platinum Corp. ("Nickel Creek" or the "Company") is pleased to report that its Phase II metallurgical testwork program ("Phase II Metallurgical Program") on the Nickel Shäw Project (the "Project") located in the Yukon, Canada is advancing into Mini Pilot Plant ("MPP") testing. The Phase II Metallurgical Program is the most in-depth and comprehensive analytical undertaking that has ever been applied to the Nickel Shäw Project. Diane Garrett, President and CEO of the Company commented "During 2017 we produced a quality, marketable bulk Ni-Cu-PGM concentrate (see press release dated March 1, 2017). Prior to finalizing the mine plan, we decided to test the viability of separating the nickel and copper concentrates. Producing two separate concentrates is expected to result in enhanced economics for the Project and provide us with requisite flexibility in marketing the concentrates. Our recently completed work has demonstrated that there are no barriers to the technical process of separating nickel and copper. We will now begin a mini pilot plant test program which enables the production of separate nickel and copper concentrates and quantifies the grades and recoveries of those concentrates. Precious metals (PGMs and gold) and cobalt will be measured in the concentrates. "The commencement of MPP testing is the final stage of the metallurgical testing at the Nickel Shäw Project. Over the past 18 months the Company has focused on de-risking Nickel Shäw through a series of detailed and scientifically based studies including a new geologic model, the Phase I Metallurgical program, which demonstrated viability of producing a saleable bulk concentrate, a foundation for an optimized mine plan and process flow sheet, and a new NI 43-101 resource estimate. By the end of the current and final stage of metallurgical testwork, the Company should be well positioned to continue moving the Project up the value chain towards the goal of advancing the Project to become Canada's next large scale nickel-copper-cobalt-PGM sulfide producer." Reassess and confirm primary grind: As part of the flowsheet optimization, there has been success with using a coarser grind than required in previous testing. A coarser grind has the potential to provide several economic advantages to the ultimate flowsheet design. Reduce reagent and retention time: There have been positive results using less reagents under a low pH environment and migrating to higher flotation density in the rougher circuits – resulting in lower potential operating costs associated with reagents and projected size of flotation circuit capital expenditures. Demonstrate copper/nickel separation: As outlined in the January 2018 news release referenced above, we were able to demonstrate from open circuit tests and mineralogical evaluation that there were no barriers to achieving separate copper and nickel concentrates. Prepare for MPP testing using representative Run-of-Mine (ROM) samples: The MPP metallurgical program will be conducted on composites generated from the ~4,000 kg of material obtained from the 2017 drill program. The composites have been selected and blended to ensure they are representative of Nickel Shäw production material and were tested to validate grade, geological and spatial representivity of the deposit. The MPP testing will commence shortly with production runs operating on a 24-hour schedule. The Company expects to report on the results from this program early in the third quarter of this year. Upon completion of the Phase II Metallurgical Program, Nickel Creek should be in a position to incorporate the results into a new mine plan and economic model to serve as a basis for a Preliminary Economic Assessment ("PEA"), which will also incorporate the complete findings from the last 18 months of technical studies on the Project. Results from the PEA are expected to be released in the fall of 2018. Looking ahead, the Company is planning an exploration program to examine the endowment potential within the Nickel Shäw Project area. The current resource area spans over 2.2 km in strike length along an 18 km trend within the land package held by the Company. Historic and current high-level mapping, geophysics, and limited previous drilling provide us with confidence that additional mineralization beyond the known resource may be identified. Following up on the 2017 mapping program, the Company is planning to conduct a geophysics program this year to test several of the underexplored targets, including: the western extension of the deposit, as well as Arch, North Arm, Trove and Quill. The program will incorporate a comprehensive pole/dipole induced polarization ("IP") survey to potentially locate additional disseminated sulphides. Through this work, the Company aims to identify additional drill targets along the strike length of the system to determine whether the already large resource is part of an even larger, district scale system. "Nickel Creek Platinum is committed to working diligently to increase shareholder value and maintaining the highest level of commitment to our Project's many stakeholders." Noted Diane Garrett "We appreciate the support from our shareholders who understand this work is a necessary and critically important step in a project's development. We believe we are uniquely positioned for the current market which has an ever-growing demand for commodities related to electric vehicles and grid storage." About Nickel Creek Platinum Corp.
Nickel Creek Platinum Corp. (TSX: NCP; OTCQX: NCPCF) is a Canadian mining exploration and development company focused on advancing its 100%-owned Nickel Shäw Project with a view to creating Canada's next world-class nickel sulphide mine. The Project has exceptional access to infrastructure, located three hours west of Whitehorse via the paved Alaska Highway, which further offers year-round access to deep-sea shipping ports in southern Alaska. The Company is led by a management team with a proven track record of successful discovery, development, financing and operation of large-scale projects. Our vision is to create value for our stakeholders through development of the Nickel Shäw Project into a leading North American nickel, copper and PGM producer. The scientific and technical information disclosed in this news release in relation to metallurgical testing, including with respect to the Phase II Metallurgical Program, was reviewed and approved by Gordon Marrs, P. Eng., who is a "Qualified Person" as defined in NI 43-101 – Standards of Disclosure for Mineral Projects ("NI 43-101"), and an independent consultant to the Company. All other scientific and technical information disclosed in this news release was reviewed and approved by James Berry, Nickel Creek's Chief Geologist and a "Qualified Person" as defined in NI 43-101. Please see the technical report dated June 26, 2017, filed under the Company's profile at www.sedar.com, for a description of the Company's data verification and QA/QC procedures. Cautionary Note Regarding Forward-Looking Information: This news release includes certain information that may be deemed "forward-looking information". Forward-looking information can generally be identified by the use of forward-looking terminology such as "may", "will", "expect", "intend", "believe", "continue", "plans" or similar terminology, or negative connotations thereof. All information in this release, other than information of historical facts, including, without limitation, regarding the results or expected results of the Phase II Metallurgical Program, MPP and other technical test work, the potential to produce separate saleable copper and nickel concentrates, the potential for favourable impacts to Project capital requirements and operating costs, the potential to advance the Project to production, the potential to identify additional mineralization beyond the known resource, timing of releasing test results as well as results of a PEA, and general future plans and objectives for the Company and the Nickel Shäw Project, are forward-looking information that involve various risks and uncertainties. Although the Company believes that the expectations expressed in such forward-looking information are based on reasonable assumptions, such expectations are not guarantees of future performance and actual results or developments may differ materially from those in the forward-looking information. For more information on the Company and the key assumptions, risks and challenges with respect to the forward-looking information discussed herein, and about our business in general, investors should review the Company's most recently filed annual information form, and other continuous disclosure filings which are available at www.sedar.com. Readers are cautioned not to place undue reliance on forward-looking information. The Company does not undertake to update any forward-looking information, except in accordance with applicable securities laws. SOURCE Nickel Creek Platinum Corp.